Fly tying is tricky, but with some simple and clear instruction, you can tie flies. All it takes is an understanding of the basic techniques, and you're off and running. And, if you're already tying flies, but you need some help with more advanced techniques, we're here to help you with that too. As an instructor, Skip will help you understand the subtleties, strategies, and mechanics of tying so you can confidently tie better flies, and as a result, catch more fish. Eleven fly tying books, and over two hundred and fifty fly tying and fishing articles—Skip Morris has spent over forty years researching and refining the art of tying flies. The early books on tying had grainy black and white pictures, and vague descriptions—from these thin resources he developed a knack for explaining this craft in clear and simple detail. The links at the bottom of this page will take you to all sorts of articles Skip has published in the major fly fishing magazines over the years. 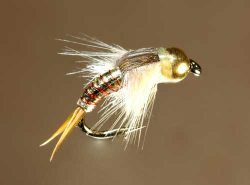 These articles cover a wide range of topics, from simple techniques to specific fly patterns. There is information on how to make cleaner thread heads and a neat Matuka wing, or how to tie hot flies like the Turck Tarantula and the Gabriel's Trumpet.